For thousands of years, leadership in Egypt has been associated with that great source of life the Nile. From the first pharaoh, Narmer (3100 BC), who traditionally diverted the river at Memphis, to Nektanebos (360 BC), the last Egyptian pharaoh, canals were cleared and irrigation projects were carried out. When the Persians conquered Egypt they repaired waterways. The Greeks reclaimed land. The Romans built aqueducts. The Mamluks constructed aqueducts and storage systems. In 1842 the Mohamed Aly Barrage was built at the apex of the Delta north of Cairo. This first barrage was followed by others: at Aswan, Esna, and Assiut. The first Aswan Dam was constructed between 1899-1902. It was raised in 1907-1912, and again in 1929-1934, at which time 5,000 million cubic metres of water was stored in a reservoir that backed upstream to Wadi Haifa. The High Dam, situated six-and-a-half kilometres south of the Aswan Dam, was the cornerstone of the country’s economic development envisioned by Gamal Abdel Nasser. It was built during the years 1960-71 and was largely financed and supervised by the Soviet Union after the withdrawal of US and British financial aid for the project. Thirty thousand Egyptians worked on shifts day and night for ten years, under the supervision of two thousand technicians. A total of 17,000,000 cubic metres of rock was excavated, and 42,700,000 cubic metres of construction material was used. The High Dam is a rock-filled dam - an artificial mountain of earth and rock over a cement and clay core. It is 3,600 metres long, 114 metres high, and the width at the base is 980 metres. The diversion tunnels on the western bank of the river (each with a diameter of sixteen-and-a-half metres), were hewn out of granite to a length of 1,950 metres. On the eastern bank are the High Dam’s twelve turbines, each with 120,000 HP. The annual hydro-electric capacity is ten billion KW hours. High Dam lake was formed when the thwarted Nile swelled back upon itself for hundreds of kilometres where Nubia once stood. It is the world’s largest artificial lake. It extends for over 500 kilometres, 150 of which are in Sudanese territory. The average width is ten kilometres, and there are areas where it spreads across thirty kilometres. The storage capacity is 157 billion cubic metres. 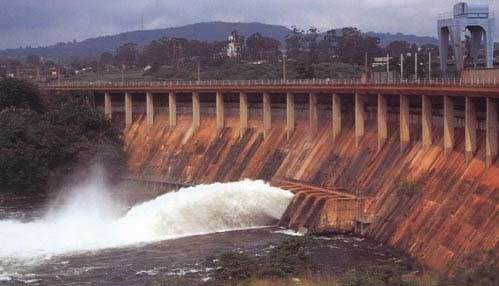 Advantages The primary purpose of the High Dam is to expand Egypt’s arable land, provide hydro-electric power for the benefit of industrial development, and ensure a substantial rise in the standard of living. 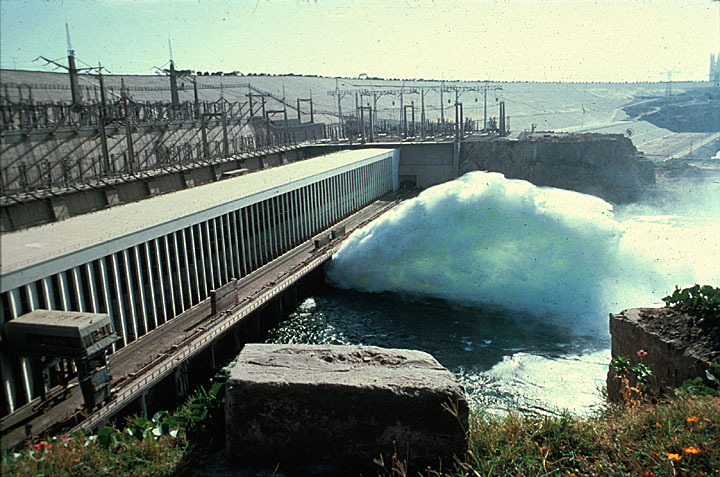 Due to this long-term storage of water, regular irrigation is possible, and Egypt’s productivity has been increased by over twenty per cent: from 800,000 hectares of reclaimed desert land, and from the increased yield resulting from the change-over from a one- crop to a three-crop cycle. The latter was made possible by the stabilisation of the river, which overcomes the danger of high and low floods and also enables permanent navigability. The loss of silt has been compensated for by fertilizer, one of the many industries provided with hydro-electric power from the dam. Another industry is a shale brick factory that will replace the age-old brick made of Nile silt. Disadvantages An increase in the arable land has led to a corresponding increase in the incidence of bilharzia which can now, fortunately, be controlled. Predatory fish from the Red Sea, no longer hindered by the fresh water flow that acted as a barrier, have been seen in the Mediterranean for the first time; the resulting loss to fisheries is partly compensated by a large fishing industry on the Lake. The loss of the annual flood, and the constant higher average water level, has resulted in increased salinity of the soil. This has affected crops and ancient monuments; the agricultural land, especially in the Delta, now requires constant irrigation and drainage; and the ancient monuments of Upper Egypt are suffering some damage from seepage and salt erosion. The most tragic loss has, of course, been Nubia. No less than 100,000 persons had to be uprooted and relocated in Upper Egypt and the Sudan when plans for the High Dam went ahead and it was clear that their homes were destined to disappear forever. Ironically, it is due to the disappearance of Nubia that we know more about its history than we do of many sites in Egypt, including Luxor! For, during the years 1960-69, the doomed land was subject to the most concentrated archaeological operations ever mounted. Scholars, engineers, architects, and photographers from over thirty countries fought against time, and some great monuments were saved (page 146) or documented for future study. Countless objects were excavated and removed to safety. However, much of Nubia’s heritage in the form of towns, tombs, temples, churches, graffiti and inscriptions, has been engulfed by the waters.